We often promote cross channel marketing here at Benchmark Email. There are opportunities to promote your social networking channels via email marketing and also ways to promote your email marketing on your social networking pages. One way to do that is by placing a signup box for your newsletters directly on your Facebook Page. Benchmark Email has an app that allows you to do so with ease. You can follow these simple steps to add a signup box to your Facebook Page. The end product is a signup box that matches the Facebook colors and size of a tab. For many, this is all they want or need. If you would like to add a logo or change the colors of your signup box, there is a different approach. 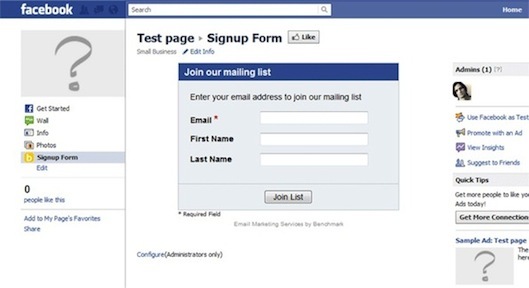 Rather than using the Benchmark Email Signup Form app, you must create the signup box within your Benchmark Email account and then paste the code to your Facebook Page. I will walk you through the steps to do so. 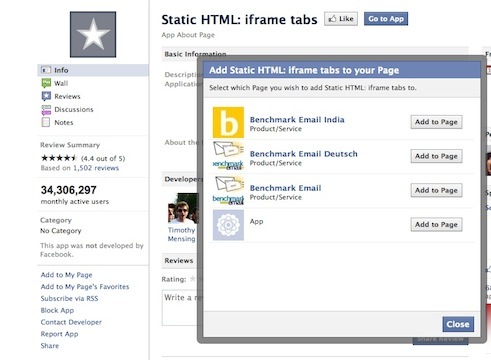 First, you must add an iframe tab to your Facebook Page. To do this, click Add to My Page in the left hand column on the iframe tab app page. A popup window will ask you to decide which of your Pages you would like to add the iframe tab to. Hit Add to Page to select it. Go to your Facebook Page. Select Edit Page and click on Apps in the left hand column. Find the iframe tab you’ve just added and click on Edit Settings. Now change the name of the tab to Newsletter, Signup for our Newsletter, or anything else more creative you can come up with. In a new window, log in to your Benchmark Email account. Follow the normal steps to create a signup box. During Step 2 of this process you can choose to upload a logo and change the color scheme. At the bottom of Step 4 you will see the code for the signup box. Make sure that Raw HTML is selected. Copy the code. Now go back to your Facebook Page. Click on your newly created iframe tab. It will read "Welcome" and have a square icon with a star in it. Paste the signup box code into the top box. Click Save and view tab. Now your custom signup box has been placed onto your Facebook Page.